As the largest opening on your home, your garage door can either hurt or help your home’s appeal, value and energy efficiency. If you’re looking for a unique alternative to your garage door, a carriage garage door might fit your needs. For a traditional and classic style, homeowners look towards carriage style garage doors. While original carriage doors opened outward on hinges, our carriage style garage doors are built the same as sectional garage doors. You’ll get the warm, inviting feeling of carriage style doors with the functionality of modern garage doors. 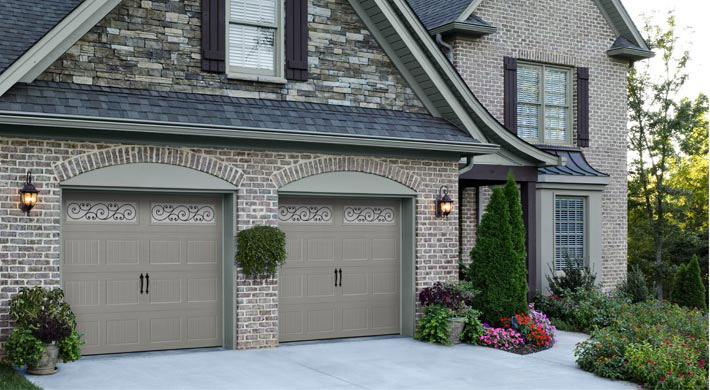 Your home’s curb appeal with definitely benefit from carriage garage doors from Feldco. There’s a lot of unpredictable weather in Madison, so you need a garage door that can withstand it all and work flawlessly during the process. Feldco carriage garage doors are made from high quality, thick gauge steel to give you the best in durability and strength. We even have insulation options for homeowners who want the most out of their carriage garage door. We know that every homeowner has different tastes and that’s why we don’t limit our customers to what they can choose from. You can craft your ideal carriage garage door with us. We have many different color options, panel configurations, hardware and even window insert options to choose from. There’s sure to be a combination that catches your eye. Carriage garage doors from Feldco will enhance your home’s energy efficiency by not letting any unwanted drafts enter your garage. You need your garage to be a regulated temperature year round to keep your valuables protected from the weather. Our insulated garage doors will not only help you save on heating and cooling bills, they’ll also help reduce noise. With the insulated core, our garage doors are better able to block out any noise. This is especially helpful for homes with garages that are next to or beneath any rooms. Feldco stands out from the rest because of our extensive customization options, friendly service and professional installation. Your carriage garage door will look great, function flawlessly and keep your home comfortable.